This post may include affiliate links. See my full disclosure here. Do you REALLY love tacos? I mean REALLY love tacos? If so, then I created these adult coloring sheets just for you! 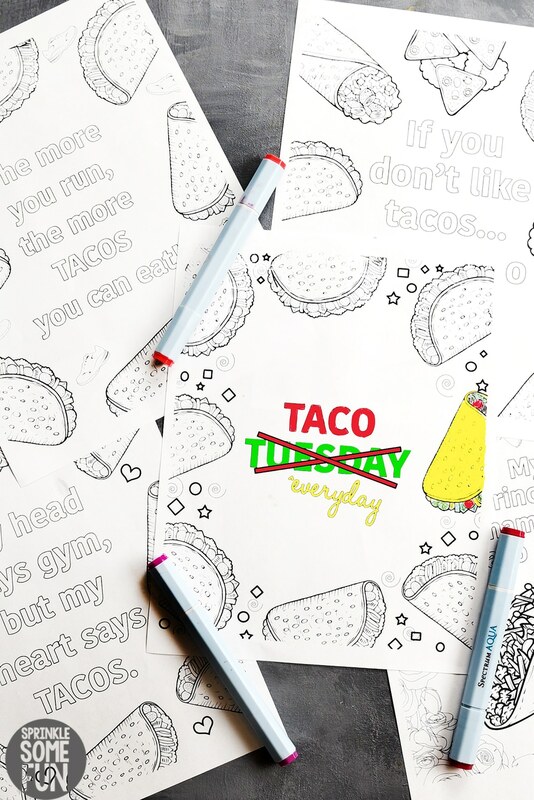 These 5 FREE Funny Taco Quotes Coloring Pages are just too cute not to share with you. If you are in need of a good laugh (who isn’t) and something relaxing to do then try out these fun taco quote pages. I am always amazed that something so simple, like coloring, can help to lift my mood. 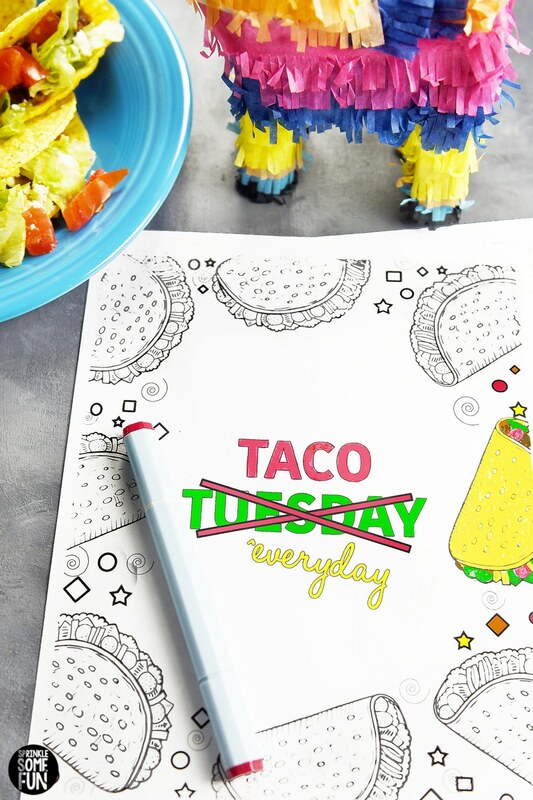 I am combining my love for tacos and coloring with these cute printables. I hope they will brighten your day a little bit! The best part is that you can grab these custom printable Funny Taco Quotes for FREE! Yep, you heard that right. I enjoy making these exclusive designs for my VIP readers because I appreciate you all so much. Print them out for yourself or gift them to someone else that loves tacos too! These are great for adults and kids alike. Since I still have small children at home; this has made a great family activity for our Taco Tuesdays. I know these are called “adult” coloring pages, but of course they are super fun for kids to color too. Hey, anytime my kids will spend a little time coloring with mommy is good with me. It doesn’t always last very long, but they are often more quiet that usual when they are coloring. It’s a win win. These printables are supposed to be light hearted and give you a little chuckle when coloring them. Let me introduce you to Ms. Taco Belle! 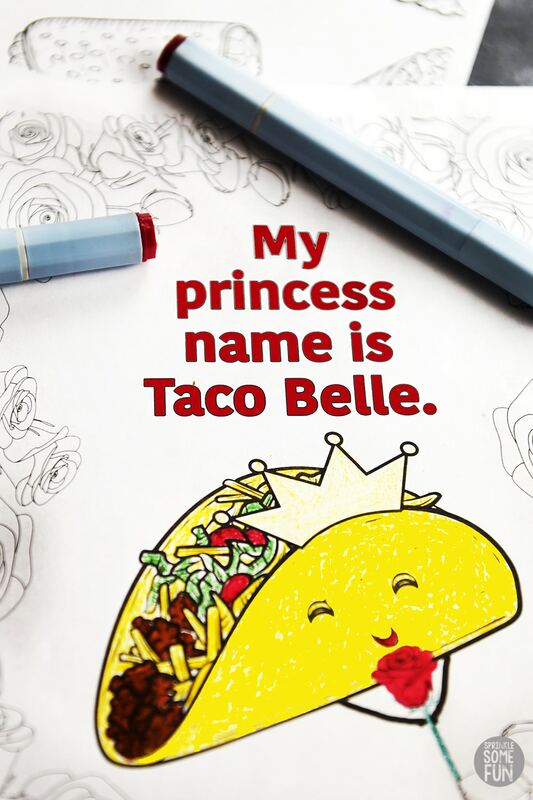 LOL I just love this “Taco Belle” princess coloring page. It’s a trifecta for me since I love tacos, printables and Belle from Beauty and the Beast. Plus, it’s just a cute play on words. My little girls just LOVE “Taco Belle” and pretty much any taco loving princess should too! If you want to skip my super helpful advice and tips and go straight to the free printable coloring pages; just scroll down to the bottom where you can subscribe to download. My head says gym, but my heart says TACOS! The more you run, the more TACOS you can eat. If you don’t like TACOS… I’m nacho type. My princess name is TACO BELLE. Adult coloring pages are a well known way to relax and help put your mind at ease. Since these have a bit of humor as well it’s sure to be a great mood lifter! I am going to be sending these to a friend that needs a little pick me up. You could also use them as fun gifts as well for all your taco loving friends. Print them out, wrap them nicely and then maybe include a gift card to their favorite taco shop and you are set! I like to use cardstock for the best results. Most often the problem with regular printer paper is just that the markers can bleed through or the texture of the surface you are coloring on can show through. Regular paper is just fine, but if I was giving them as gifts I think the cardstock is a nice added touch. Plus, in a gift bag or box it might hold up better. I like this cardstock here (affiliate) for a reasonable price and good quality. Decide what kind of coloring tools you want to use. Here are my favorite markers (affiliate), colored pencils (affiliate) and my favorite water colors (affiliate links). I also have to include my favorite smelly markers because they just make life a little more FUN and nostalgic! Here are the best: Mr. Sketch Markers (affiliate). I have to admit the smelly markers alone put me in a good mood! To get all the mood relaxing benefits of coloring, remember, any mistakes are just “Happy Little Accidents”. As the wonderful Bob Ross would often say. If you really want a do-over just print out a new one and start again. I hope you enjoy these funny adult coloring pages as much as we do. I love them so much that I know I will be designing more soon. Sign up below and you’ll get access to all future FREE coloring printables as well. To access these adult coloring pages and ANY of the FREE coloring pages, you’ll need the VIP code. Don’t worry. I will never sell your information and I never spam. I VALUE you way too much for that. You only need to sign up once and you will receive the code to access all the printable coloring pages for Sprinkle Some Fun. 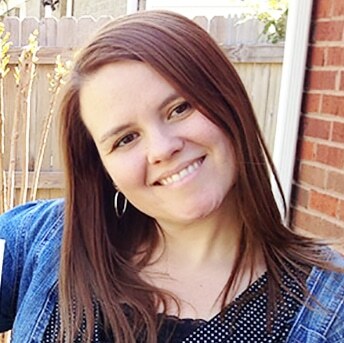 As a VIP, you’ll get notifications about my most recent posts along with my best recipes, tips for party planning, crafts and the latest blog news (& FREE printables yay!). 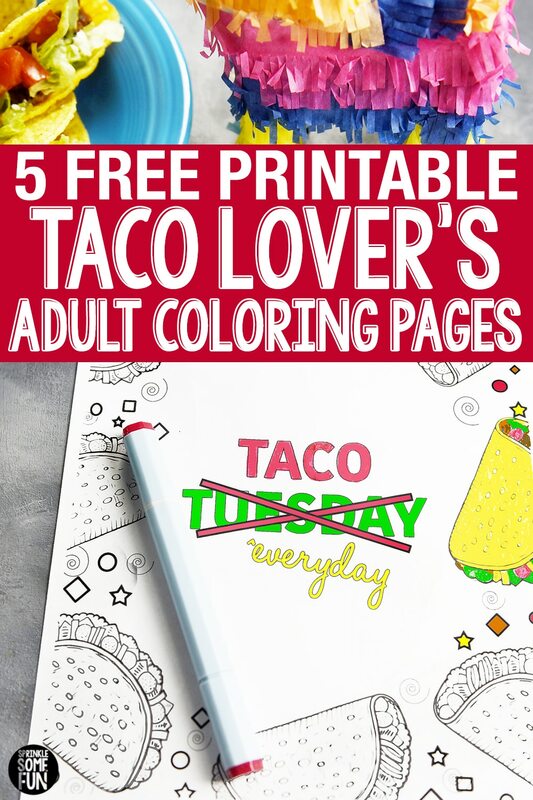 If you LOVE these Funny Taco Quotes Coloring Pages, be sure to stop on over in my Pinterest Community to share a picture of YOUR completed pictures! Or share it on Instagram and tag me #sprinklesomefun so I can see it! These 5 FREE Funny Taco Quotes Coloring Pages are for personal use only. You may not alter them or redistribute them for monetary gain without written consent from the author, Rachel Rockwell (Sprinkle Some Fun).